I have inaugurated coverage of a rolling average of the regional Fed manufacturing new orders reports. Right now they are sending a powerful signal, and we'll find out how probative that is this coming Friday. 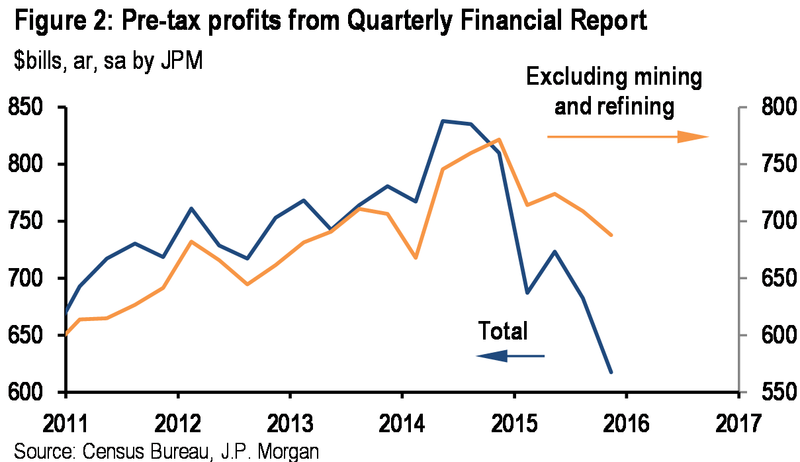 The estimated earnings decline for Q1 2016 is -8.4%. 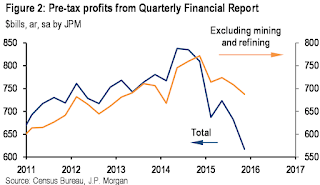 If this is the final earnings decline for the quarter, it will mark the first time the index has seen four consecutive quarters of year-over-year declines in earnings since Q4 2008 through Q3 2009. It will also mark the largest year-over-year decline in earnings since Q3 2009 (-15.7%). Only three sectors are projected to report year-over-year growth in earnings, led by the Telecom Services and Consumer Discretionary sectors. Seven sectors are projected to report a year-over-year decline in earnings, led by the Energy, Materials, and Industrials sectors. To reiterate: we’re potentially looking at 5 consecutive quarters of revenue declines and four consecutive quarters of earnings declines. These are bear market statistics. 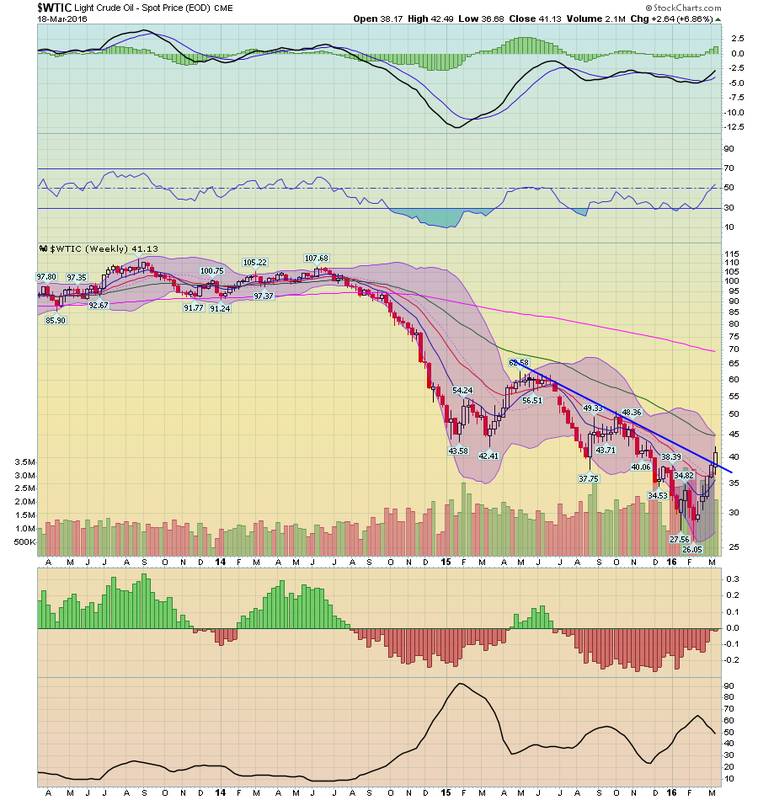 And they go a long way to explaining why I continue to be slightly bearish regarding the markets. 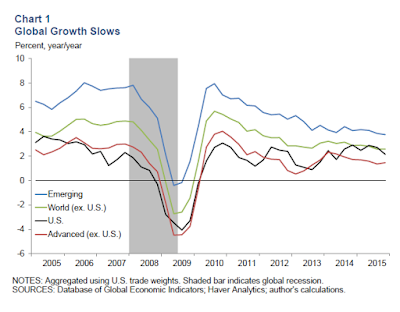 Next Thursday, March 31 at 3PM CST, I'll be doing a free webinar that will review the last month or so of US economic data along with an overview of the major markets (equities and bonds). It's free! It'll last at most 30 minutes (probably shorter). You can sign up here. 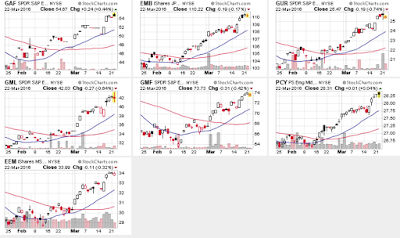 A week from today (Thursday, March 31) at 3PM CST, I'll be doing a free webinar that will review the last month or so of US economic data along with an overview of the major markets (equities and bonds). It's free! It'll last at most 30 minutes (probably shorter). You can sign up here. 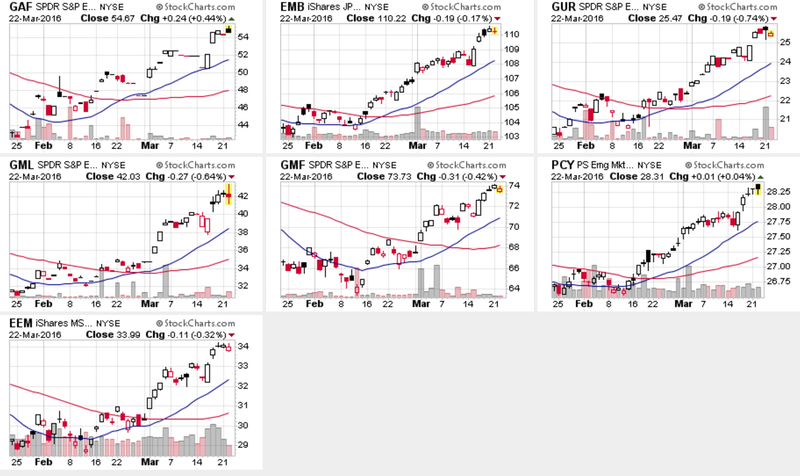 Time to Go Long on Emerging Markets? 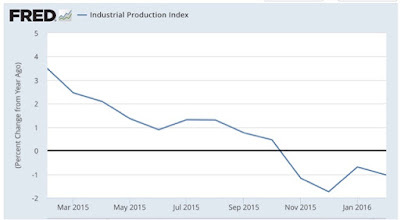 Is Industrial Production "less bad"? 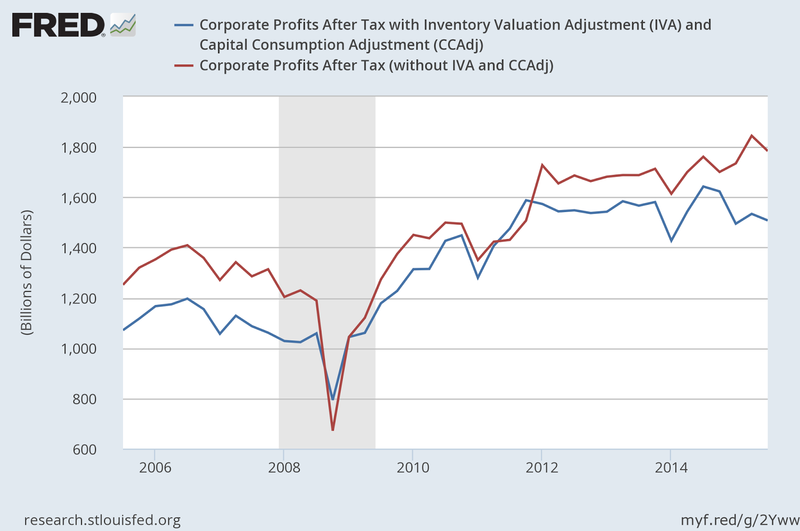 One of my pet peeves is analysis that relies too much on Year-over-year comparisons, as in "X is still YoY positive/negative." If you do that, you are going to miss turning points, which happened sometime during that year - perhaps many months before the sign turned. But one good use of YoY comparisons is to see if they are getting "less good/bad." 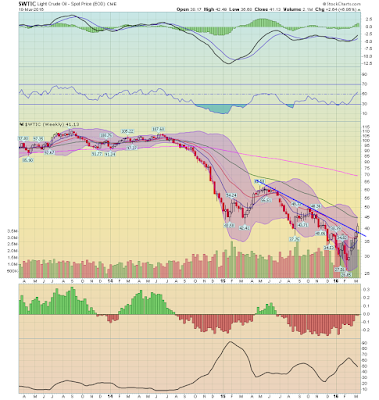 This will help you spot a change in trend. 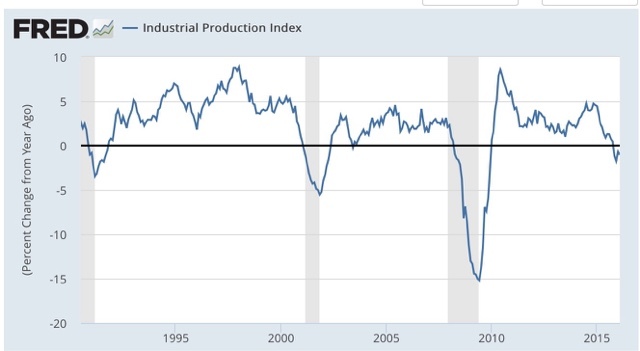 YoY industrial production tends to bottom right at the end of recessions (this is true of most recessions over the last 100 years, the above graph is limited better to show the current situation). 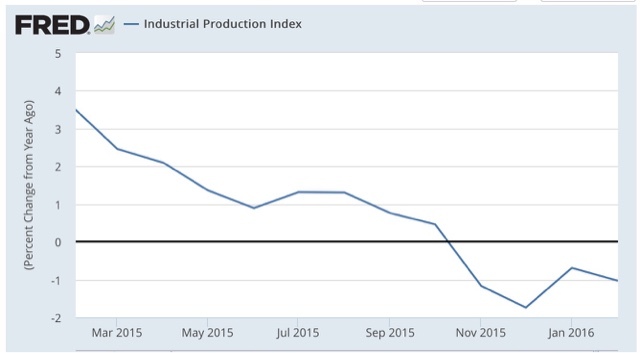 That little hook at the right is the recent improvement in YoY industrial production. There have only been two months of "less worse" readings, and they are well within the range of noise. 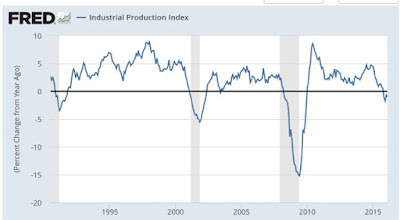 I would like to see several more months of such improvement before I would be confident that the shallow industrial recession has bottomed -- although, with the recent decline in the US$, that is the more likely scenario. Don't forget about our monthly economic and market review on Thu March 31 at 3PM. It's a free webinar. You can sign up at this link. This is quite a series of events from Fed President Lockhart. We know that in January and early February, the world's financial markets, including our own, went through an episode of significant volatility. From the first trading day of January, investors appeared to go "risk off" and headed for safety. A number of concerns seemed to gang up on investors: the weak fourth quarter here in the United States, economic weakness globally in advanced economies and emerging markets, the apparent economic slowdown in China, Chinese currency depreciation, and the falling oil price and what that could mean for global demand. We know that an important index that measures financial volatility—the VIX—rose to a level above 28 (a very high reading) on February 11 and has since settled back to a much calmer reading around 15. 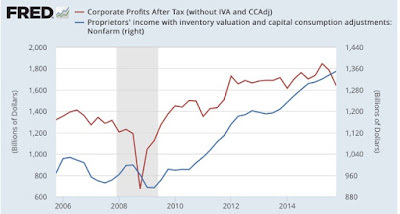 We know that financial markets here have substantially recovered lost value, but we do not know if the volatility investors experienced and the public observed in January and early February will have any extended impact on the broad economy. We know that on March 5, the government of China stated its GDP growth target for the next measurement period at a range of 6.5 to 7.0 percent. The introduction of a range was interpreted as allowing for lower growth than recorded in the past, reinforcing the sense that China's economy is slowing. We know that the Bank of Japan—Japan's central bank—unveiled a negative rate policy on January 29. Japan joined the eurozone in using negative official rates to spur inflation and growth. We know that on March 10, the European Central Bank deployed Mario Draghi's "bazooka." The ECB pushed its policy rate more into negative territory and took other strong measures in an attempt to pull the eurozone out of its persistent weak state evidenced by very low inflation. These are some highlights of a rough start to the year. 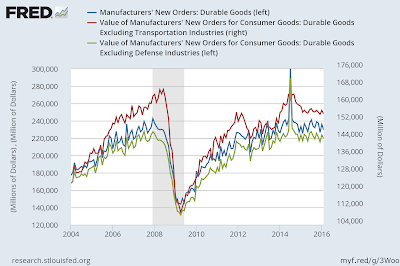 As I said, the context has mutated somewhat since December, even if, all things considered, the economy remains on a positive trajectory. The recent poor numbers on wholesaler and retailer inventories and sales stand in stark juxtaposition to the improvement in weekly reports of steel production, rail transport (until last week! ), and consumer spending by the likes of Goldman Sachs and Gallup. The monthly numbers say deterioration, while the weekly numbers say improvement. 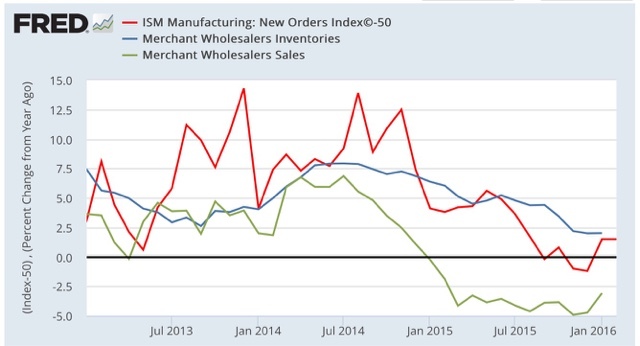 ISM new orders have show two months of slight improvement, while inventories are no better than flat, and sales continue to decline. 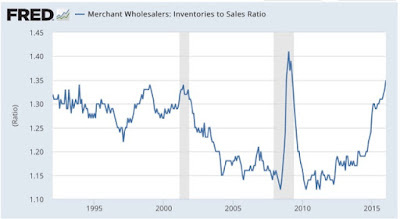 Inventories haven't really followed sales at all. 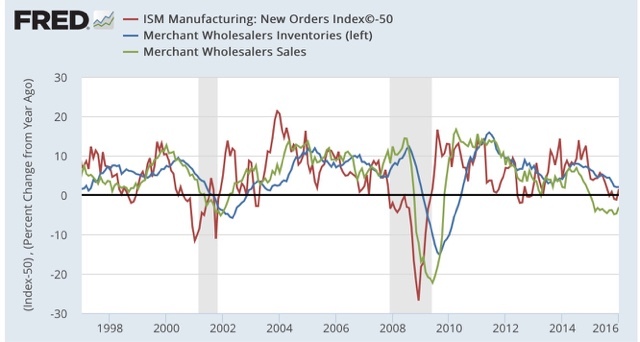 If this is an incipient recession, then I would expect inventories to follow sales, which means that ISM new orders are giving a false signal. 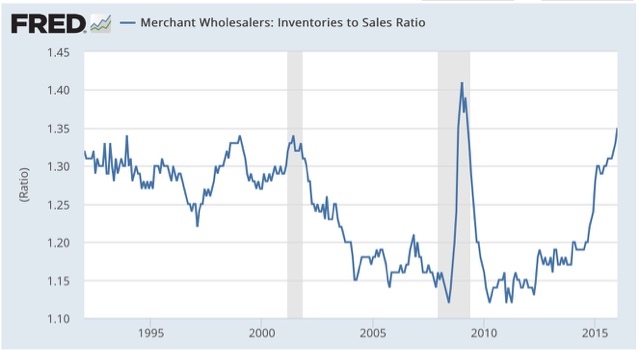 On the other hand, if this is simply a slowdown, like 1998 (far left in the first graph), then sales should turn positive, and like 1998 inventories will not decline, in which case it is elevated inventories that are giving the false signal. 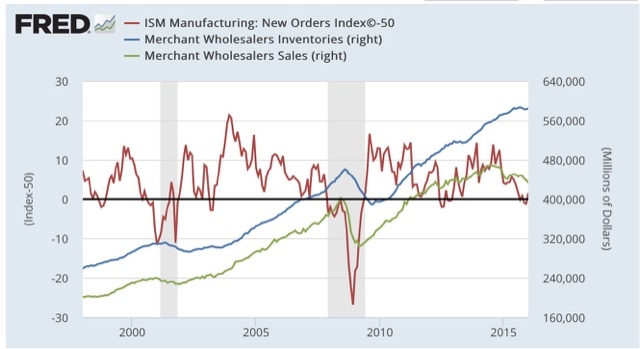 Bottom line: either ISM new orders are falsely signaling optimism, or business inventory accumulation is falsely signaling pessimism. 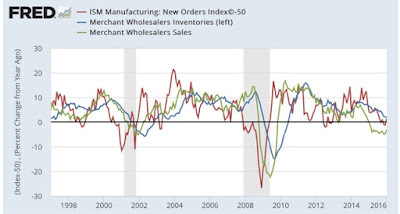 A cause for optimism that the discrepancy will resolve to the upside is that the regional March Empire State, Philly, and as of this morning Richmond manufacturing indexes have all shown a positive spike in new orders. Don't forget about our monthly economic and market review on Thu March 31 at 3PM. You can sign up at this link. 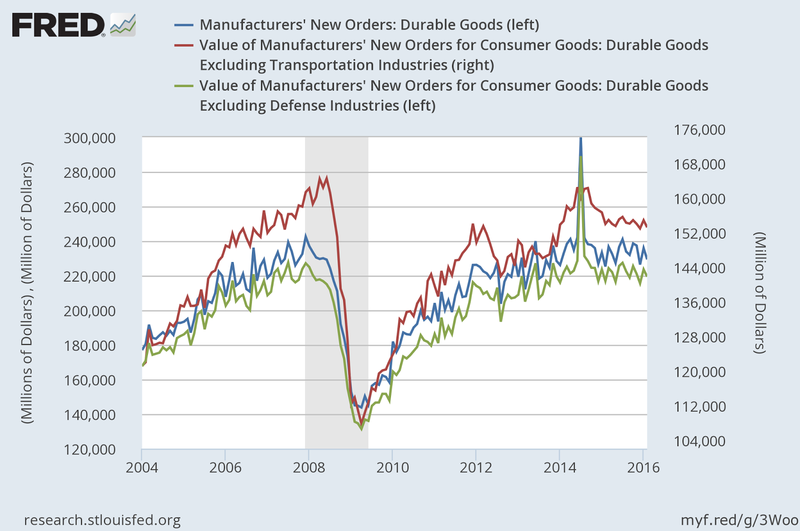 At the beginning of this year, I identified graphs of 5 aspects of the economy that most bore watching. With the first 2 months of data under our belts, let's take a look at each of them. The Fed having embarked on a tightening regimen as of December, the question is, will the yield curve compress or, worse, invert, an inversion being a nearly infallible sign of a recession to come in about 12 months. Rates on 2 year treasuries have risen slightly, while the 10 year treasury yield has fallen (typically long rates only start to fall once the tightening cycle has caused the economy to weaken). 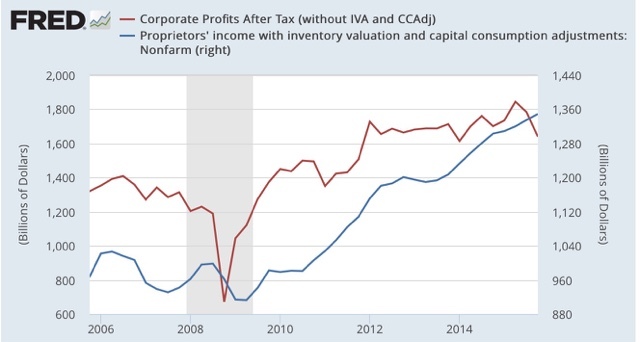 Still the difference in the two rates, at about 1%, is typical when measured over the long term. There is no particular tightness here. 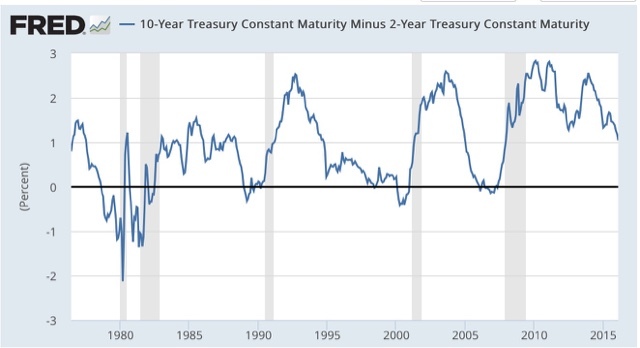 At the same time, if the trend continues (no guarantee of that), then even as few as two more .25% rate hikes by the Fed could cause the yield curve to invert. 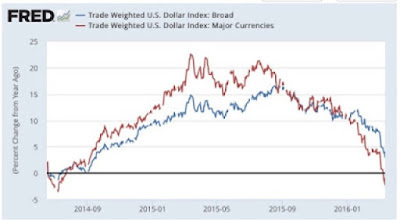 Against all currencies, the US$ is now only up 3% -- a typical reading. 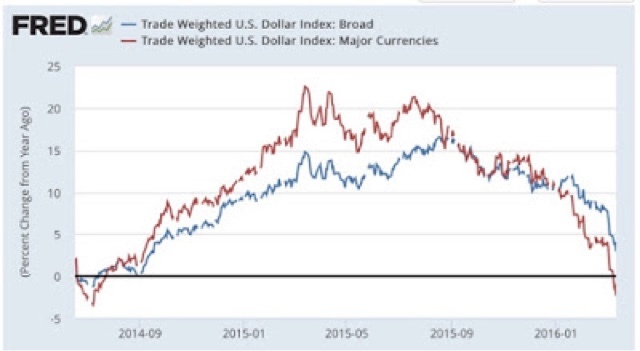 Against major currencies, the US$ has actually declined YoY. This is good news. Typically sales peak/trough first, and inventories catch up with a lag. 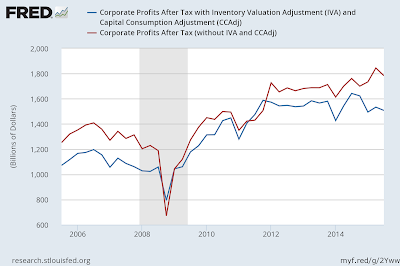 In late 2015, inventories went sideways, even as sales continued to slide. 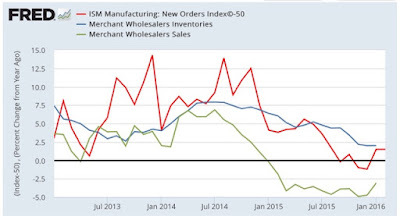 In the last two months, not only have sales continued to decline, but more inventory has been accumulated. 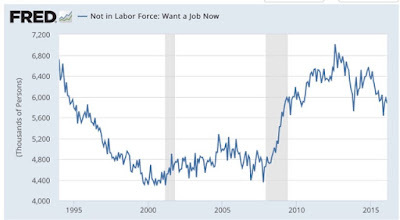 This is going in the wrong direction, and is about the single worst statistic in the economy. This may be just noise, or it may herald a stagnation in improvement. In the 1990s and 2000s, once the U6 underemployment rate fell under 10%, nominal wage growth started to accelerate. U6 is now 9.7%, and there has been some mild improvement off the bottom. 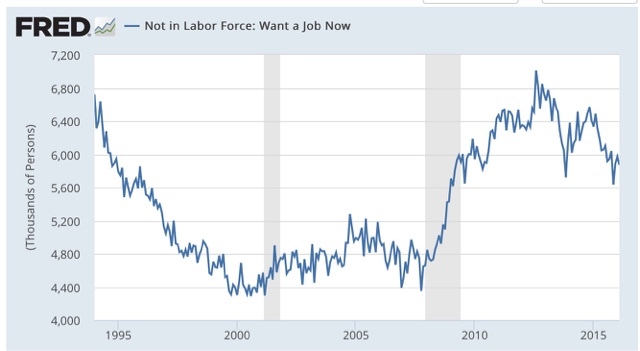 More than anything, the US needs real wage growth for labor, and the present nominal reading of slightly over 2% still isn't nearly good enough.